Phototoxicity consists in the capability of certain innocuous molecules to become toxic when subjected to suitable illumination. In order to discover new photoactive drugs or characterize phototoxic pollutants, it would be advantageous to use simple biological tests of phototoxicy. In this work, we present a pilot screening of 37 dyes to test for phototoxic effects in the roundworm Caenorhabditis elegans. For the phototoxicity, uptake assays, and for qRT-PCR experiments, synchronized populations of Caenorhabditis elegans SS104 strain (glp-4 [bn2], a temperature sensitive sterile mutant) were cultured at non permissive temperature (25°C) in Nematode Growth Medium as described previously . On the 1st day of adult stage, animals were washed twice in saline solution (modified K-medium: 52 mM NaCl and 32 mM KCl  + 0.01% Triton X-100) and transferred to flat bottomed 96-well microplates (Greiner Bio-one Cat. 655101). 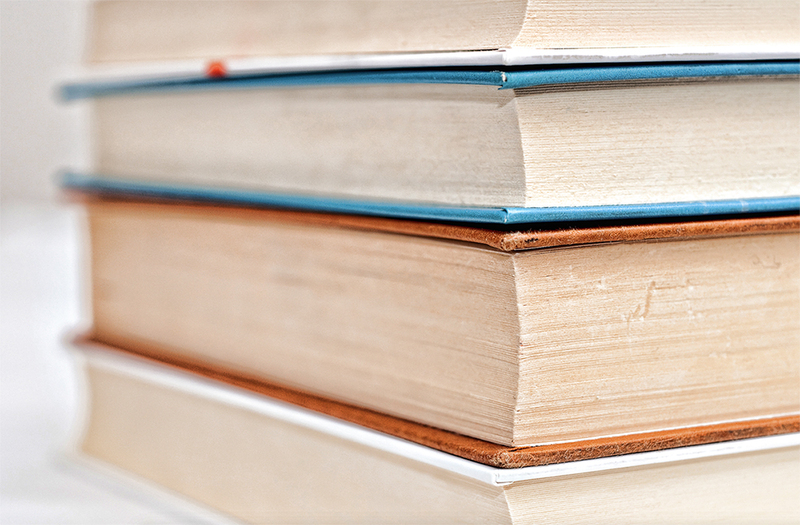 An average of 50 animals was used per well with a final volume of 100 μl. One hour after pipetting, basal motility of worms within the wells was assessed using an infra-red tracking device (WMicrotracker) . This basal activity was recorded to normalize any subsequent activity variations to that initial activity, eliminating differences between wells due to population size. After basal measurement, dyes were added to the culture medium at final concentrations of 0.1, 1, 10 or 100 μM and incubated for 1 h before light irradiation (where applied). Dye photoactivation was carried out exposing the microplates for 30 min under a fluorescent white light source (2700°K white fluorescent lamp R7s 20W, Sica, Argentina) at 10 mW/cm2 of intensity. An additional water IR-filter (3-cm wide) was used to avoid heating, as previously reported. Two well characterized dyes were tested, Luxol fast blue (not phototoxic) and rose Bengal (aphotoactive molecule). Then, other 35 dyes were tested. Locomotor activity was tracked continuously in darkness during the incubation with the dye and for 4 h after dye activation. At least 4 replicate wells were used for each experiment. 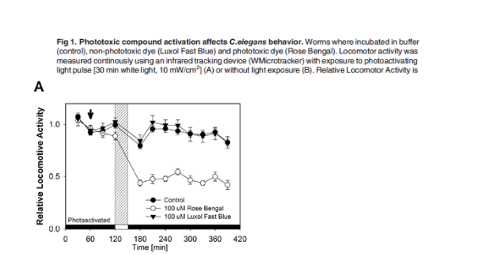 When white light irradiation (10 mW/cm2, 30 min) is applied, a significant reduction in locomotor activity is observed in the positive control (rose Bengal), and it remains low even after 4 h. Unexpectedly, an immediate response is also observed in control animals and with a negative control (Luxol fast blue) just after light irradiation, possibly as a transient response to light (Fig 1A). Neither caused an effect without light irradiation. We then selected a set of 37 dyes to test phototoxic effects in C. elegans cultures. 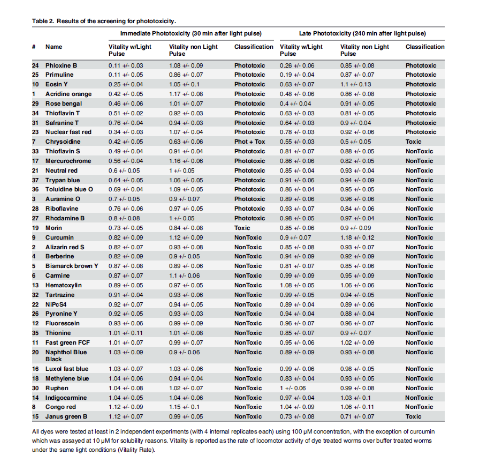 Of these, 16 have been already reported to present effects in other organisms (Table 1). Of the assessed list of 37 compounds, 16 presented immediate phototoxic effects and 8 late phototoxic effects (Table 2). In order of decreasing phototoxicity, the top 5 dyes were phloxine B > primuline > eosin Y > Acridine orange > Rose Bengal. Many of these dyes have been previously reported as phototoxic, consistent with our results. PLoS One. 2015 Jun 3;10(6):e0128898. doi: 10.1371/journal.pone.0128898. eCollection 2015.